The corner module, now named Causeway, is coming along. 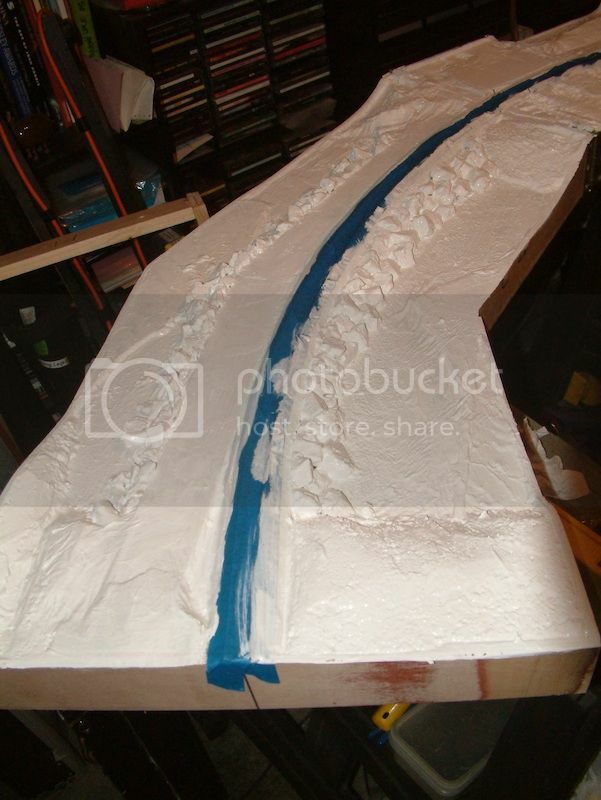 First is the snow phase, when it all gets covered with ceiling paint. 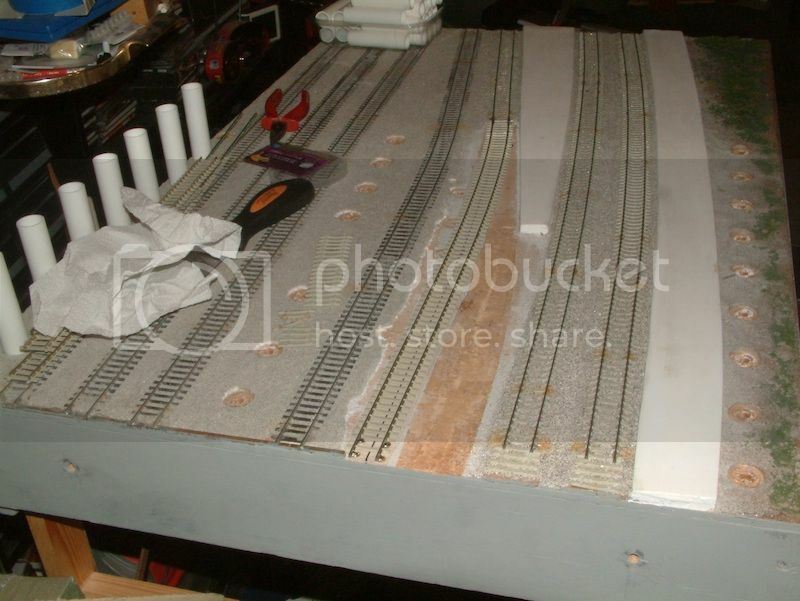 The track is protected by masking tape. It now stands on its own legs, a new method of single legs clamped in a socket has been used. If stable enough I might put these on other boards as they take up little room for transport. Finally a view of the causeway, with rocks now stained. Another day on Causeway's construction. This will probably be the last before Saturday's meeting. 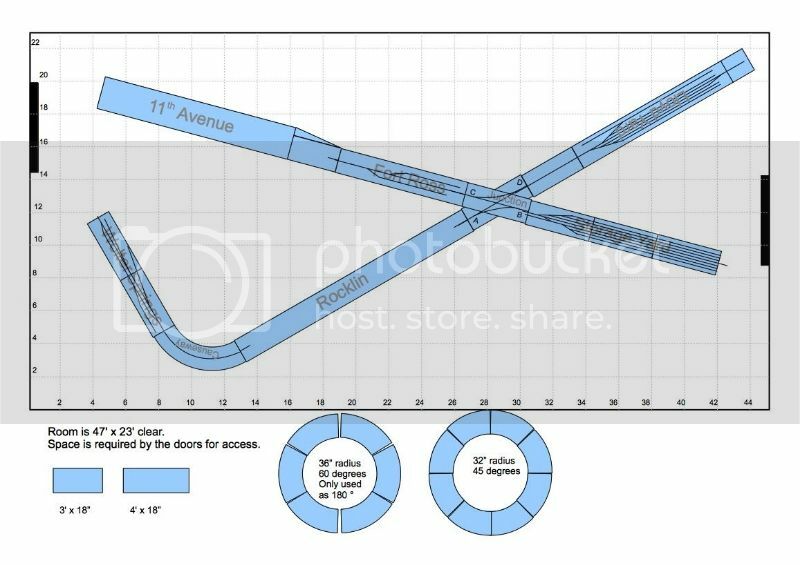 I'll see if I can get 11th Avenue's tower fitted tomorrow. 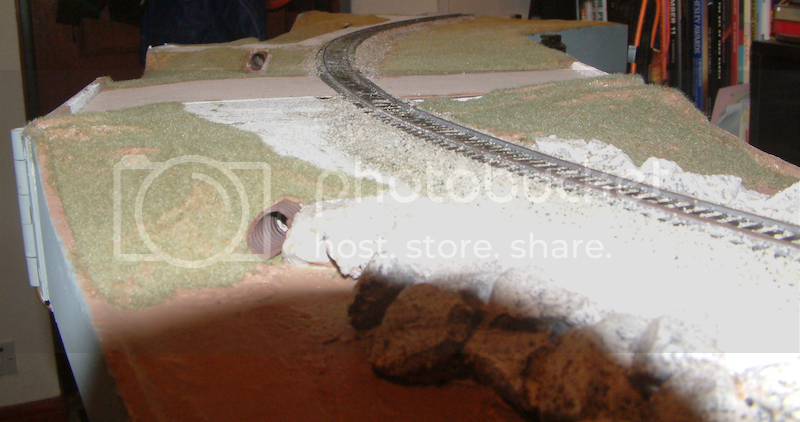 It now has static grass, FMR's small applicator and Woodland Scenics grass. I've fitted the culverts, 16mm flex conduit, one can be seen through. A potential photo opportunity. I really need to make a plain blue backscene to hang behind modules! Looks great, Mike. 25 points awarded. Looks great, remind me are we seeing it on Saturday? Yes it will be at the meeting, we need it to turn Wolter Springs across the room. With both at the end of one route, they can be tested and debugged without affecting the rest of the layout. Hopefully they work first time and add to our operations. Cool - see you guys tomorrow sometime! 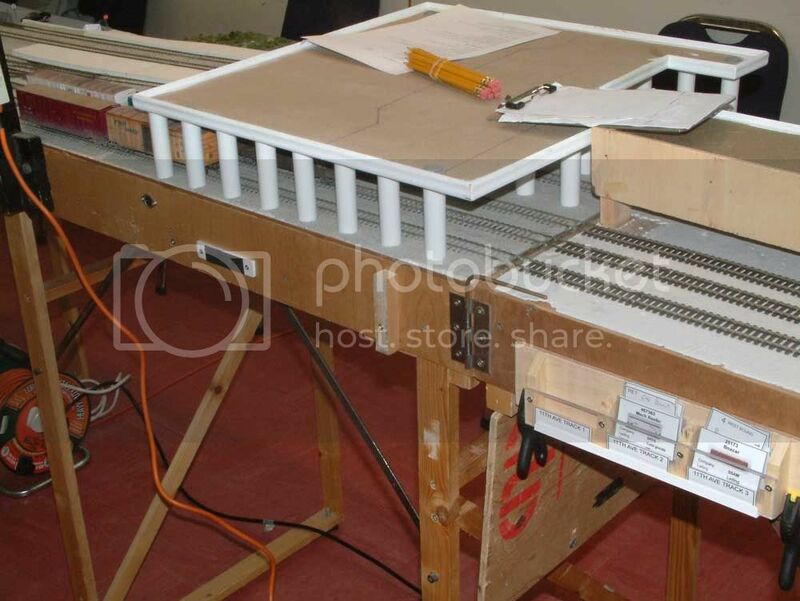 Just seen that Brian has got a video of the junction module on Model Railroader's site. After working on the East end, now to changes at the other end. 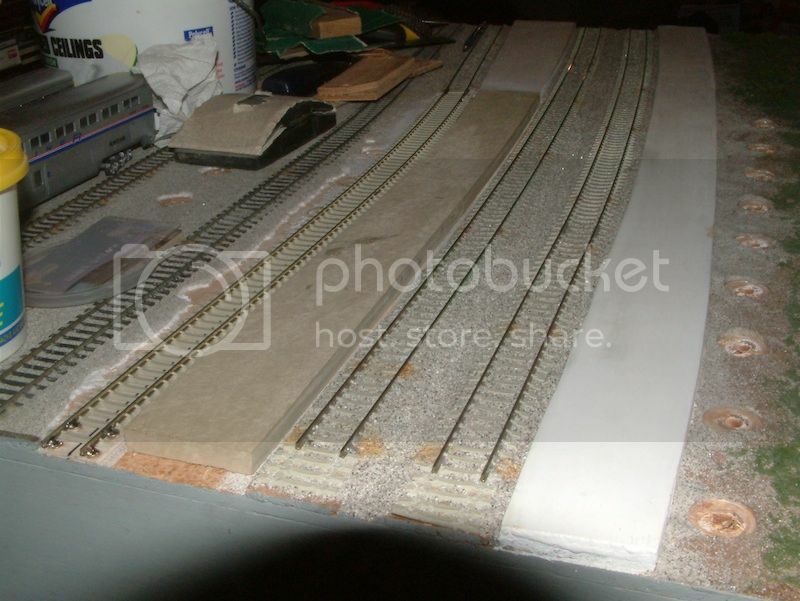 I'm shifting platform 3's track across to allow a full platform, it used to line up for the third track on the old modules. The original view of the west end. The track has been removed, along with most of the upper level support columns. The new track in place. The new platform, cut from Sundeala, luckily I had an off cut from when I laid the originals over 10 years ago. Never throw anything away! The filler that I coated them with hasn't lasted, so I'll need to buy another tub. 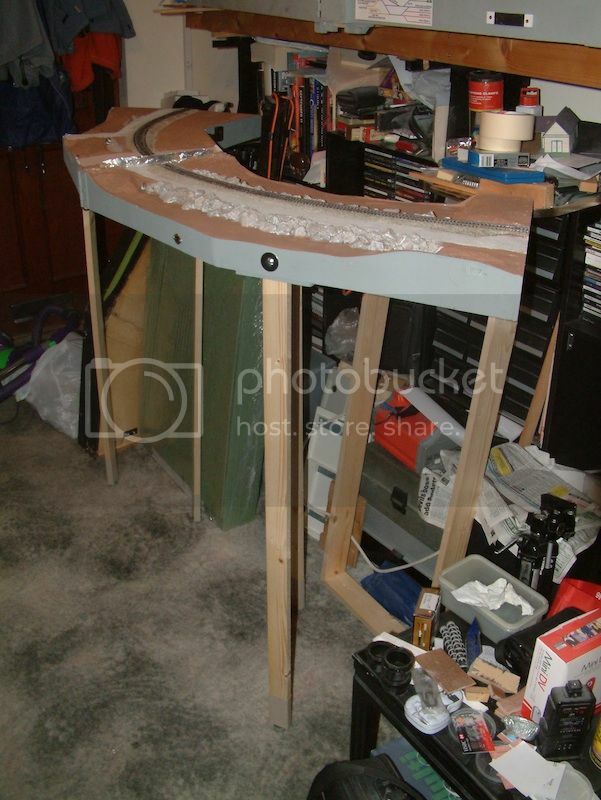 A new board, probably the old 2' that used to fit on the end will be going on the end of the layout. 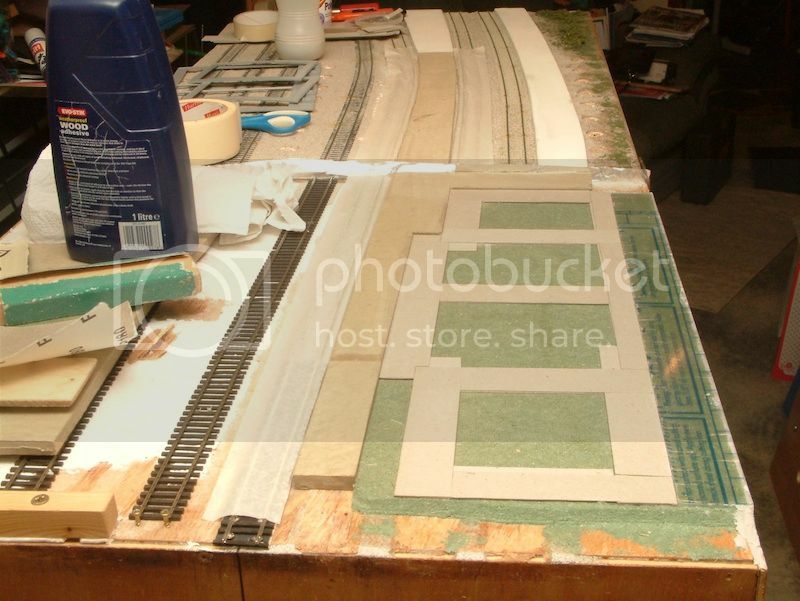 Platforms 1 & 2 will terminate, only 3 will continue through to the end of the layout. 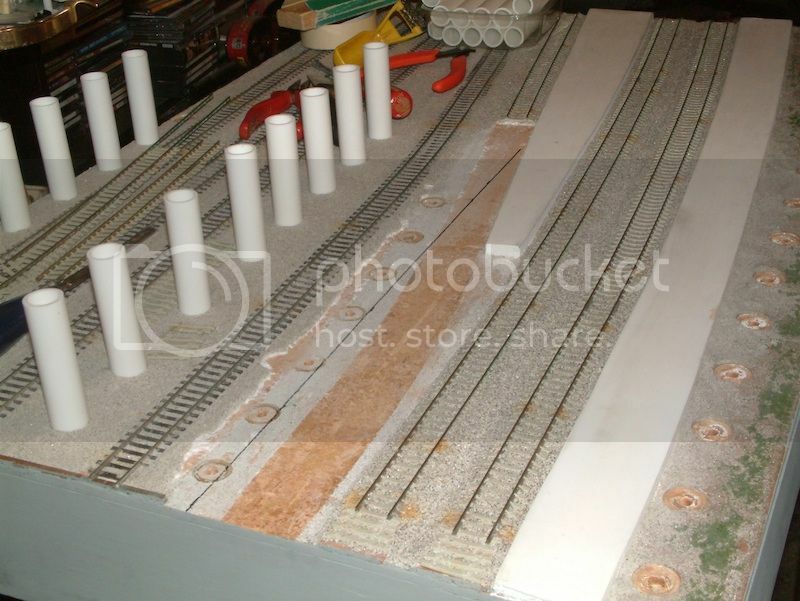 This also makes the yard tracks longer and will make the module able to run as a through module. Loco hauled trains pull into platform 3 and are the stock is then pulled out and placed into 1 or 2. You are moving along steadily Mike, only just heard about your intentions last meet, and action is already in full swing. Looking forward how it goes on from here. More work has been done to the new station. One of my old 2' boards built for the old three track standard, which used to fit on the end of this module, saving a lot of work. 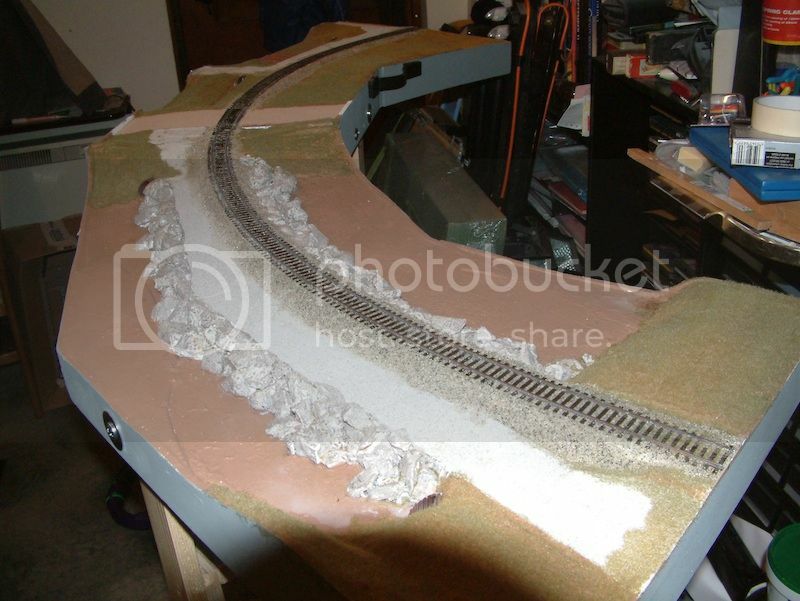 I removed the three old tracks, the yard tracks remain, just straightened. The new platform three track, which will allow 11th Avenue to become a through module was installed followed by new platforms and a base for the station, a mockup of which can be seen at left. 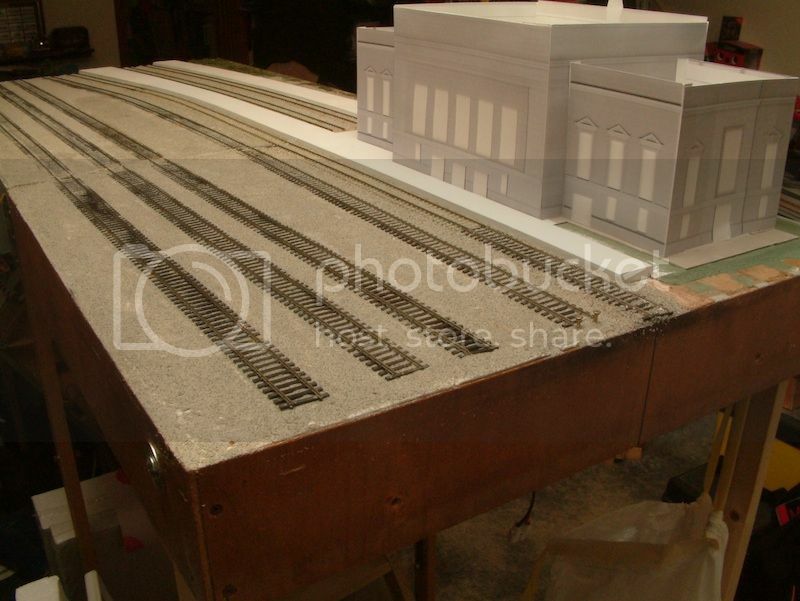 The card foundations for the building are now in, the tracks are covered to allow a fine filler to be spread on the platforms. 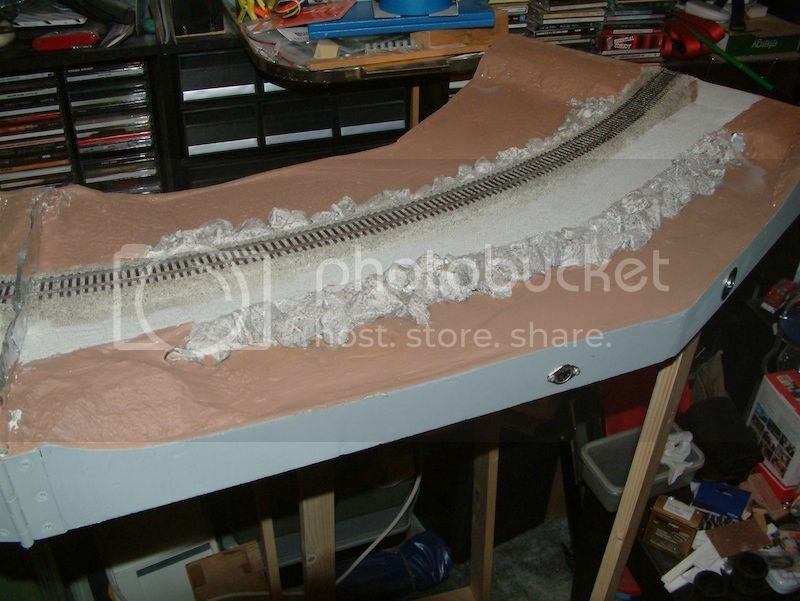 2mm acrylic sheet forms the street at the right edge. 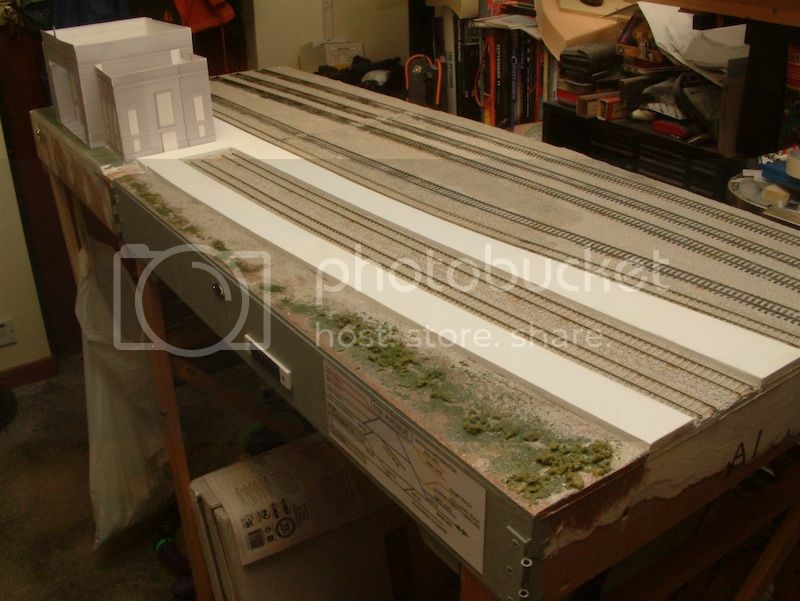 11th Avenue's platforms are now finished, and I've ballasted the tracks. 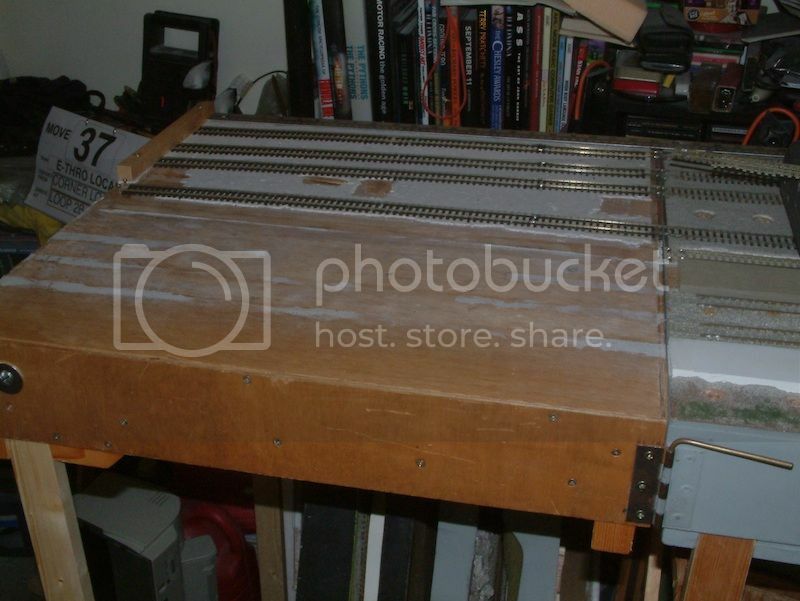 The photos show the card mockup of the Walthers kit that will go here. The front of the station. The rear with the longest platform, no3 for arrivals. Looks great, Mike. How long is platform 3? Just musing on whether it could take the arrival of an Amtrak terminating train that could be switched and turned around to go back to staging. Platform 3 is 6' long, 1 & 2 4' long. The idea is a loco hauled train would pull into 3. The stock would then be pulled back and placed in 1 or 2. The locos can then run back to the loco spur or on to the train for departure. 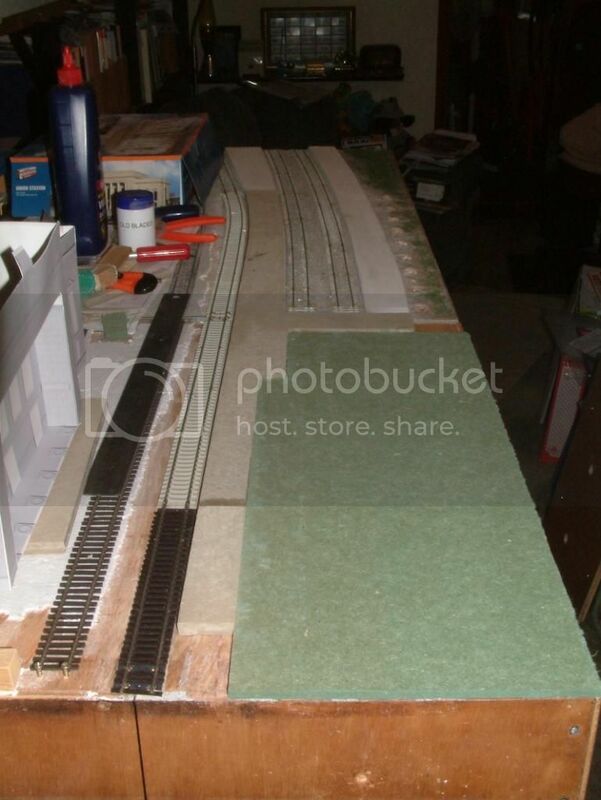 Platform 1 has 2' of clear track beyond the platform so can hold that 6' train for departure. If you don't mind stock being off the platform the train limit is around 8', but would block platform 2 on arrival. Platform 1 could take that train without blocking the furthest crossover. How long is your train? Another thought the train locos can run around 6' of stock, using the freight yard. They can then either push back into platform 1,2 or 3. Nothing to do with two F40PH loco's pulling a certain train Brian?